Fifteen awesome film directors…What were their first feature films-? Can you name the first feature film made by each of these famous Directors listed below? 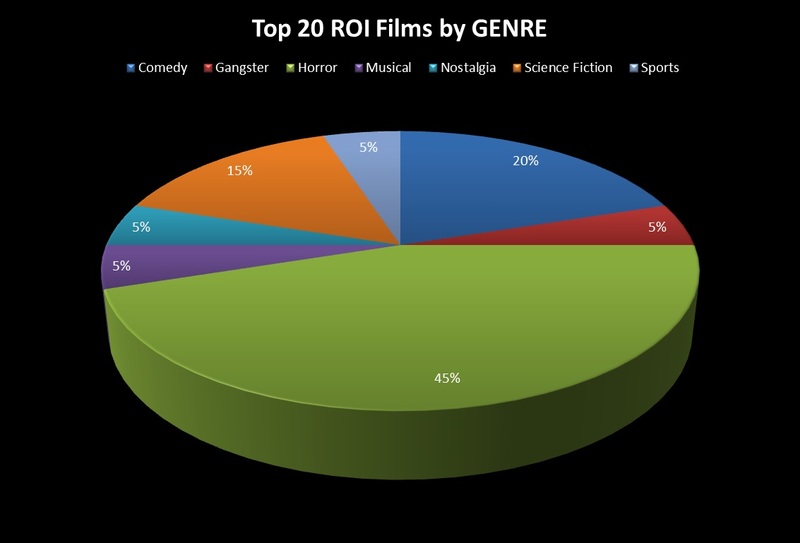 For example, The Evil Dead is a top 20 RoI film – and a classic of the horror genre. 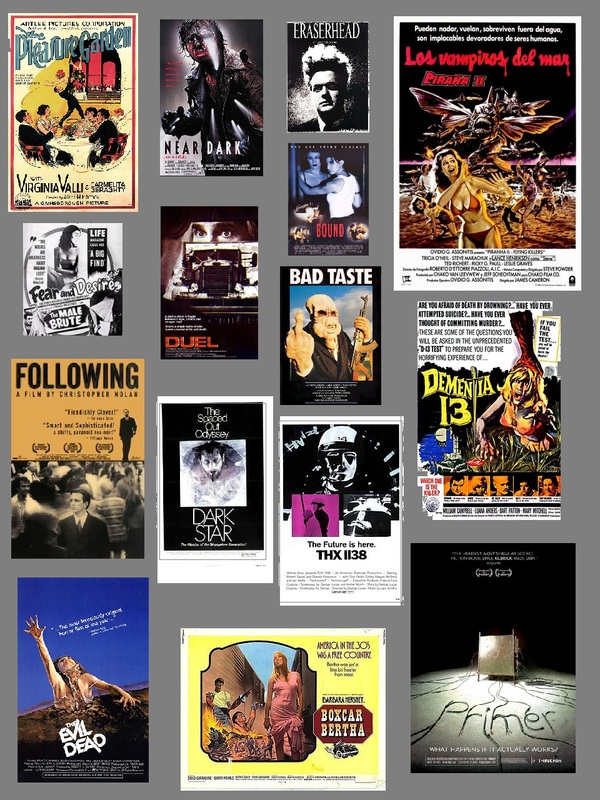 Dark Star, Duel, Near Dark and Eraserhead are cult classics. Following and Bound are amazing films. Primer is a work of genius – and is also, probably, the most intelligent sci-fi/time-travel film ever made. 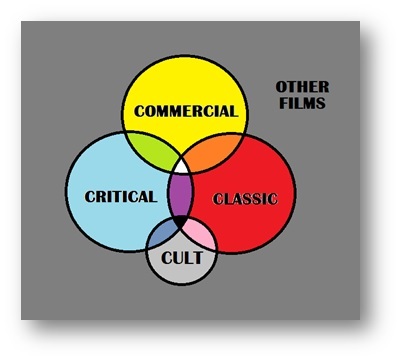 But – look more closely at all these films. 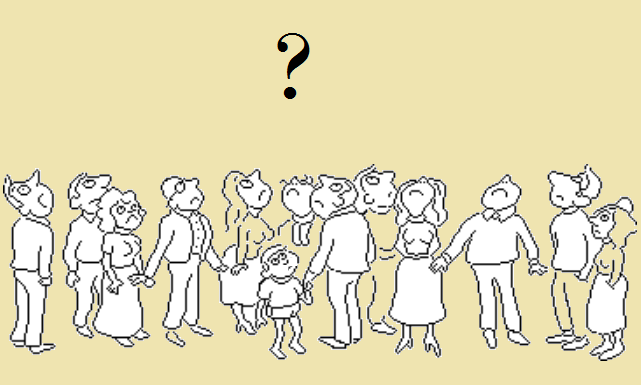 What – if anything – do they share in common? Martin Scorsese – Boxcar Bertha (Budget: $600,000 in 1972) made for the legendary Roger Corman. George Lucas – THX-1138 (Budget: $777,777.77 in 1971) – and the result of a film school film lighting exercise. James Cameron – Piranha 2 (Budget: $145,786 in 1981) and – James Cameron was fired from it. Peter Jackson – Bad Taste (Budget: NZ$30,000 or US$26,000 in 1987.) It’s no Lord Of The Rings. Steven Spielberg – Duel (Budget: $450,000 in 1971). This was a made for TV movie that later got a theatrical release. David Lynch – Eraserhead (Budget: $100,000 in 1977). The movie that Mel Brooks saw and made him want to hire Lynch, to direct The Elephant Man. Kathryn Bigelow – Near Dark (Budget: $5m, in 1987). Fascinating genre mashup of the Western, biker, and vampire genres. i.e. A classic creativity example of bisociation/combinatorial creativity/hybrid-genre movie. Shane Carruth – Primer (Budget: $7,000 in 2002). Also a top-20 RoI film. (2) It’s also – probably – not going to win any Oscars. 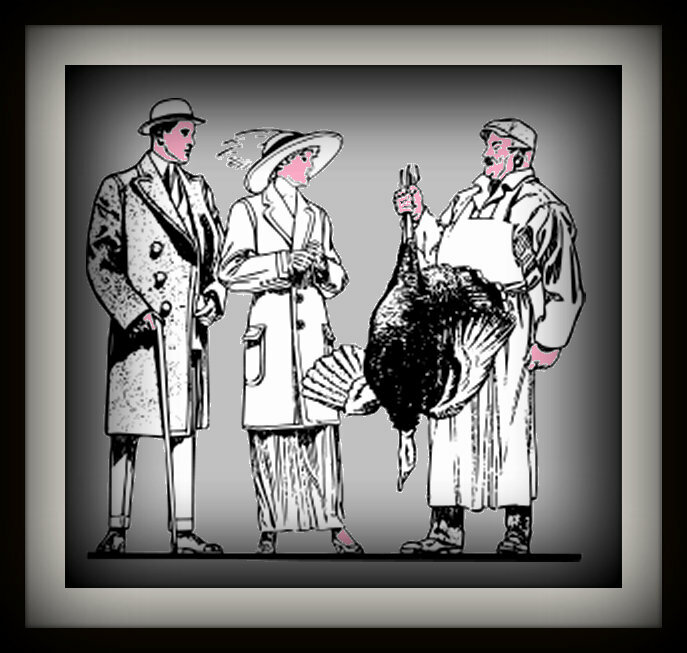 But – it may well become a cult film. 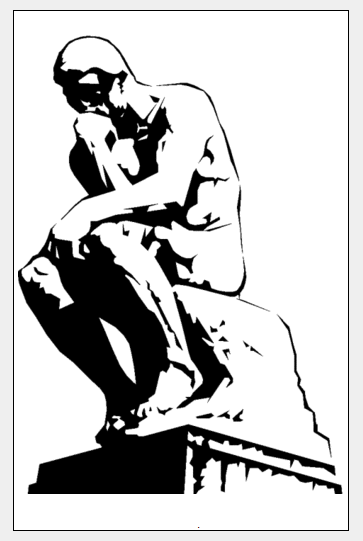 For more on all that, see: Creative Practice Theory. I guess my main point here is that – with all of these amazing Directors, we all tend to remember their classic films, but – we (mostly) don’t know their first/early films. So – it’s a really fun exercise to pick your favourite Director, and then, go back and watch their first feature film, and also check what the production budget was. On the other hand, look at, how easy it is – comparatively – now – to make a film than back in the Olden Days. Nowadays, you can make a feature film (like, a proper movie) for $7,000 – and it can become a Top 20 RoI (highest Audience-Reach compared to Production-Budget) movie. i.e. 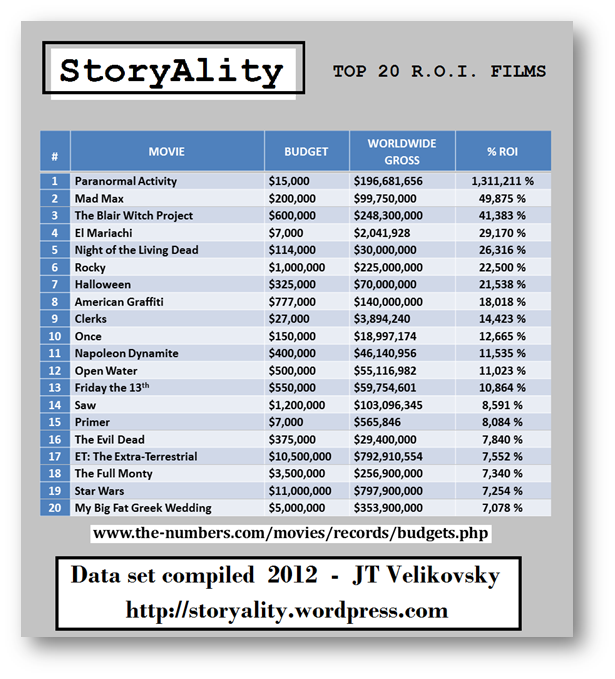 Three of the top 20 RoI movies did it. (Apparently, half the $15k budget of Paranormal Activity was spent on doing up the staircase in the house, and stuff). Anyway – I think that’s: just utterly amazing. 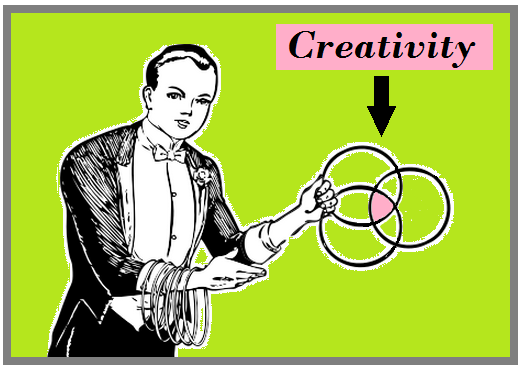 OMG – Creativity Guy is at it again…! – Appreciating the heck out of everything. 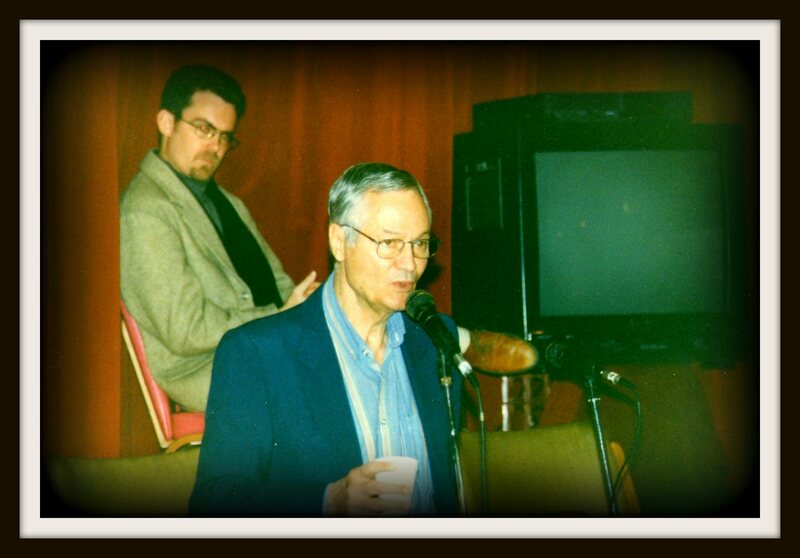 Roger (Corman) and me (JT Velikovsky) at the Open City Film Festival, Newcastle NSW Australia in 1996. And – Gee-whillikers, they sure don’t make TV-sets like that any more… Yikes. Chunky!